The Flexaway System - it looks scary, but really, it's not that bad! I received the kit in the mail - it included an assembled Flexaway mouth piece, a carrying case , a 6 month supply of bands, lubricant, and instructions. I wanted to get started right away. I brushed it clean with my toothbrush and toothpaste and per the instructions, I did it in the mirror the first time to make sure placement was right. It was really easy after the first time. 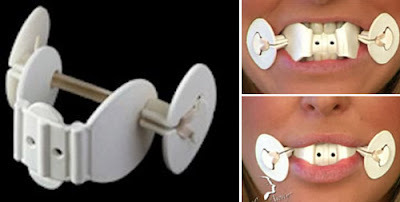 You just stretch the band apart by the side buttons, position the plate in your mouth so that you catch the bumps on the front behind your front teeth like shown in the picture above, then is time for the workout - pull the buttons together with your mouth muscles - your lips will form an "O" shape as if you were blowing out a candle. The instructions recommend reps of 30-40, twice a day for beginners. Oh I forgot about the lubricant. It's a lip balm that helps with comfort while flexing your mouth. I love this thing. I slap it in at random times of the day. While folding laundry, or writing a post ... hold on I'll brb I'm going to get it now. Why not - you just do it whenever you think of it. As far as results, I have seen a bit of chisel in the cheeks, but the main thing I notice is it is great for your complexion! I think just getting the circulation going in your face does wonders! I have been using it for a month and I think I'll keep going. It can't hurt! Flexaway touts results Results for your ENTIRE Neck, Face, Eyes, Cheeks, Mouth, Chin, and Jowls. You can purchase a kit online @ http://www.flexawaysystem.com/ - buy one at the regular price, get a second for only $10! *Follow me @jamaise at Twitter & Tweet this : RT @jamaise #GIVEAWAY #WIN - a Flexaway System ~ Facial Exerciser for a younger look in only a minute a day! http://bit.ly/96oPlS Ends 9/31 tweet each day for one entry each ! Disclaimer: Flexaway System provided me with a free sample of this product to review, and I was under no obligation to review it if I so chose. Nor was I under any obligation to write a positive review or sponsor a product giveaway in return for the free product. These views are my own. It looks like a torture device but, if it works, that's what counts. It looks interesting. Anything to help as I get older to stay young looking is worth a try. I love that it works the Neck, Face, Eyes, Cheeks, Mouth, Chin, and Jowls. WOW That's a lot! I am a follower too on GFC. Entered the CuZn Turbo Shower Giveaway! I agree with the woman who says it looks like a torture device. It would be fun to give it a try though, and if it helped, that'd be great. Follower via GFC-suebabe0704. I think it's great that you can improve/tone your face and neck without surgery. It does look a little strange, but if it works who cares how it looks. I liked the shown results of the Chin~ that is where I would benefit from using it on a regular basis. Looks fun to use. I follow your blog. Can't say I've seen anything quite like this. I'd be willing to give it a try though. Thanks. it looks kind of gimmicky but i'd give it a shot! who doesn't want a toned face and neck! Hey, it is exercise for your face, how can you go wrong! I am for it! And I am your friend on GFC - that just means I follow you, right? I mean, I am your friend regardless, but making sure I am following protocol! I am a GFC follower and the Flexaway system looks awesome! I love the before and after pictures! Entered the Bisquick Gluten Free ~ Prize Pack ~ GIVEAWAY!!! I guess we are always looking for ways to look younger but I think I would just crack up the whole time wearing it!